THE HAGUE, Oct. 15 ,China and the Netherlands on Monday pledged to jointly safeguard multilateralism and free trade by carrying out more open and pragmatic cooperation, against the backdrop of a complicated international situation with increasing uncertainties. 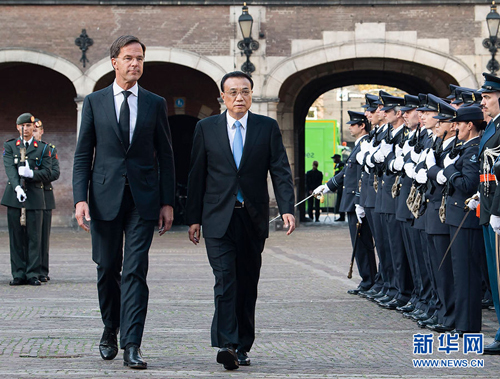 Li arrived here Sunday for a three-day official visit to the Netherlands, the first by a Chinese premier in 14 years. It is also Li's first trip to the European country as the Chinese premier. During his stay, the premier will meet with Dutch King Willem-Alexander. He is also set to visit a hi-tech exhibition and address a business forum in The Hague on Tuesday.